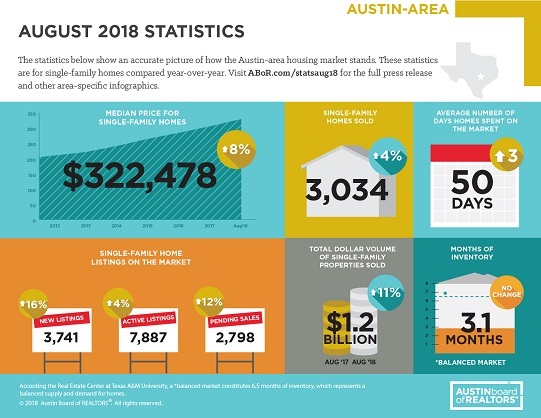 AUSTIN, TX– Continued demand for single-family homes in the Austin-Round Rock Metropolitan Statistical Area (MSA) led to the highest-grossing August on record for Central Texas home sales volume, according to the August 2018 Central Texas Housing Market Report released today by the Austin Board of REALTORS®. Strong sales led to double-digit gains in sales dollar volume for homes sold in the five-county MSA, which totaled more than $1.2 billion in August. For more information and to download the August 2018 Central Texas Housing Market Report, visit www.abor.com/statsaug18.